As this series nears its end, we would like to talk about a huge offender to not just oysters and other mollusks, but everything that lives in the ocean. Not all threats are other animals, or even living organisms at all. Some of the most deadly predators are unseen. Ocean Acidification is a huge concern in the sustainability in our oceans in the not-so-distant future. Our oceans naturally absorb carbon dioxide, and their capacity to contain CO2 is not endless, as once was thought. The more carbon emissions we create (from excessive burning of fossil fuels), the more acidic our oceans are becoming. These increasingly acidic waters have a huge effect on our ecosystems, beginning in areas where water is shallow and slowly spreading outward. Oysters and other mollusks have trouble getting the energy to build up their shells, and many spats expend all their energy and die before given the chance. On the other hand, oyster predators such as crabs have adapted to grow thicker shells to defend against the acidic waters. Starfish have been documented to consume 20% more oysters when the oysters are submitted to acidic waters (as the animals will have thinner, weaker shells and be much smaller than healthy oysters.) With food supply for these predators getting shorter, the food chain in the ecosystems they reside in is becoming more and more off balance. 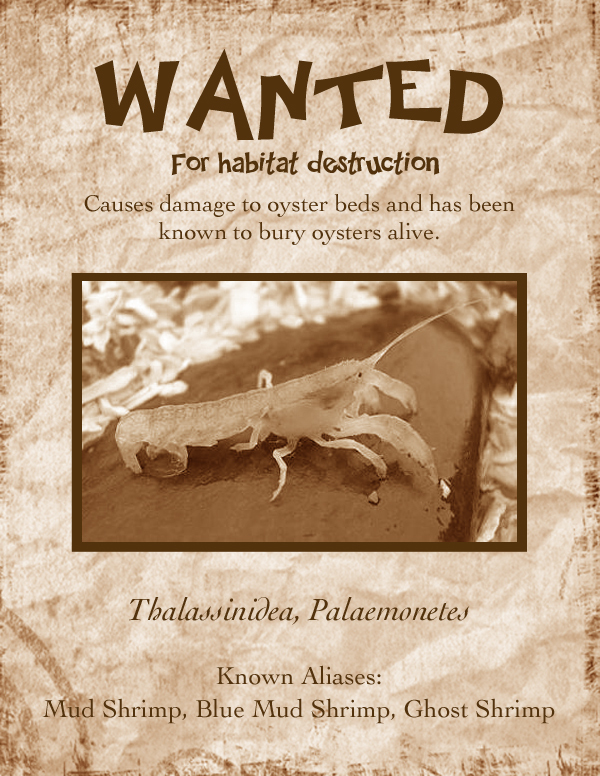 This week’s seemingly harmless offender has a very interesting method of preying on oysters and other mollusks. Snails such as the “Atlantic Oyster Drill,” “Common Whelk,”and “Moon Snail” are some of the most creative predators of the oyster and other mollusks. Don’t let their harmless reputation fool you, these killers are dreaded by oysters and oyster farmers alike. Their drill-like tongues, called “radula” are studded with sharp teeth. They bore into the shell of the oyster, releasing acidic enzymes that help soften the shell as they drill. Once the drilling is complete, they extract and eat the meat inside of the shell. If you have ever seen a piece of shell or mother-of-pearl with small holes in the surface, it is likely that they were caused by one of these assailants. Who knew those cute little snails were so deadly? 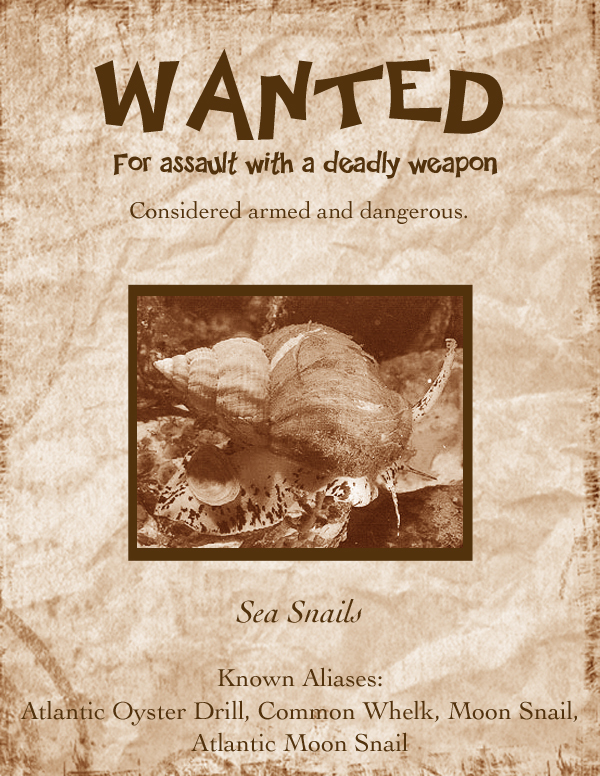 For sheer originality, the “Atlantic Oyster Drill” and the rest of its Sea Snail Gang earn the Number Four (#4) spot on our Ten Most Wanted List. Stay tuned for more unbelievable oyster threats, leading up to the Number One (#1) enemy of our beloved oysters. Many of the predators we’ve talked about in this series so far have been known to effect oyster farms and wild oysters much more severely than they do oysters in the protective facilities of pearl farms. This weeks offender is one that even pearl farmers can’t escape, and struggle to protect their stock from. Any organism that lives on the surface of any other living organism, including but not limited to barnacles, is an epibiont. Barnacles, while they appear harmless (and are harmless to many organisms) can damage oyster populations. Excessive barnacle growth on the shell of an oyster can prohibit that oyster from growing and developing properly. If the barnacles grow where the oyster’s shell opens, it can prevent the oyster from opening it’s shell to feed and breathe. Barnacle growth can also cause permanent damage to the shell, causing it to grow lopsided. This is especially detrimental in the pearling business, because a healthy oyster that grows at a consistent rate is key in producing pearls of the best quality. Since barnacles can attach to anything, including ships, piers and rocks, we wish they would be more considerate about attaching to oysters. Therefore, Number Six (#6) on our Ten Most Wanted List goes to the Epibionts. Another week, another Most Wanted! 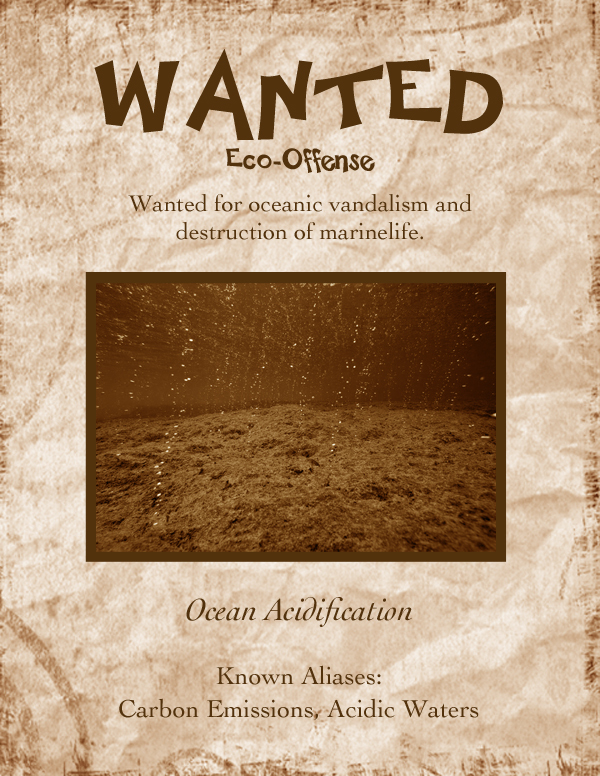 This week’s offender does not usually harm the oysters directly, but causes damage to the oysters’ environment. These crustaceans are huge threats to oyster farmers, particularly those in the food industry. These varieties of burrowing shrimp are harmful to the ecosystems in which healthy oysters thrive. They create tunnel systems in the sand or mud, disturbing the sediment so consistently that it creates an unhealthy environment. These shrimp actually decrease the level of water in the shallow oyster beds by displacing the water with stirred up sediment. This lifts and exposes oysters closer to the shore to drying wind over time, killing the exposed oysters. Ghost and Mud Shrimp can actually smother oysters with the amount of sediment that they stir up and also cause a decrease in organic matter in the soil. We don’t hold it against them that they are “ghostly” and “muddy,” but because of their lack of respect for oysters, we give them a Number Eight (#8) on our Ten Most Wanted List. 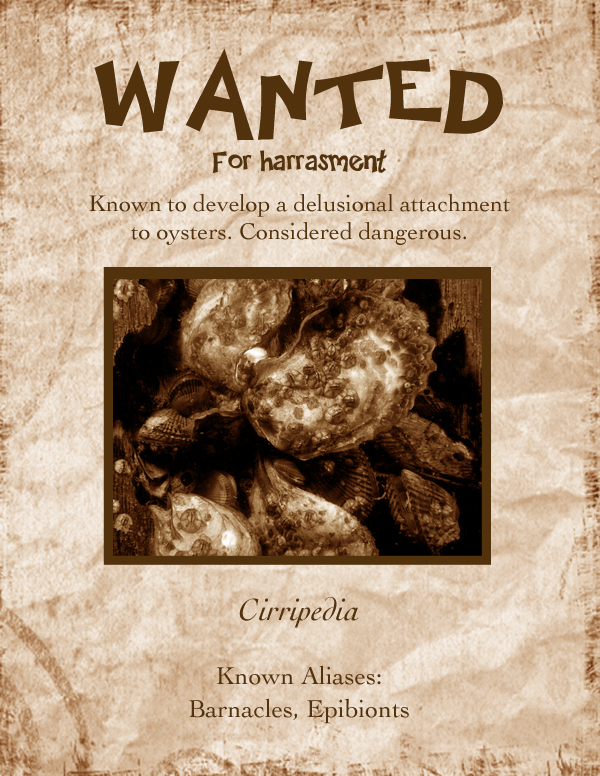 If you read our last blog, you know we have comprised a Most Wanted list for Oyster Offenders. We’re advocates of the life and safety of these little pearl-forming, ocean-cleaning parts of our aquatic ecosystems, and we are here to educate! Follow this series for neat facts about predators that live in our oceans, and more. Similar to the oyster toadfish, the cownose ray has special teeth for crushing mollusks. While feeding, they crush segments of oyster beds three feet wide and up to a foot deep! They also stir up the sediment around the oyster beds while they swim, which can bury the oysters. As oyster beds provide homes to a whole host of aquatic organisms, these rays set off a chain reaction of damages. 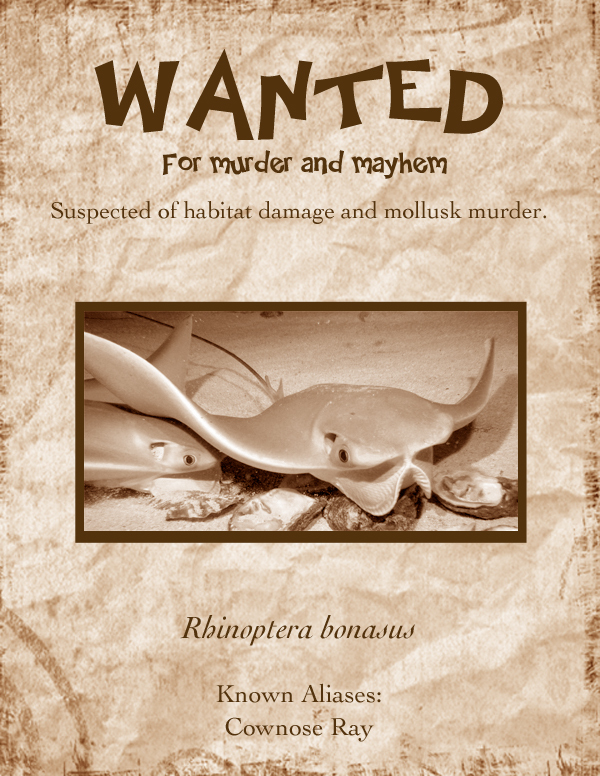 We’re all for the food chain, but we don’t want these around our special pearl oysters, so we give the Cownose Ray a Number Nine (#9) on the Ten Most Wanted List. Stay tuned for more unbelievable oyster threats, leading up to the Number One (#1) enemy of our beloved oysters. You won’t believe what some oysters go through to deliver their beautiful pearls! Natural Pearls are Demanding Center Stage! Some of the questions the Pearl Girls here at Pearls International get asked frequently by new customers are “are your pearls real?” “are these cultured pearls?” and other similar inquiries. This gives us a chance to talk about our favorite subject – the beautiful, unique gems called pearls! Walking into our shop for the first time can be overwhelming – there are so many different shapes, sizes and colors that many of the people we meet had no idea could come out of a mollusk! So, yes, ALL of our pearls are real, and most of the pearls we have on display are cultured. The vast majority of the pearls on the market today are cultured, with natural selections being found primarily at estate auctions, pearl collectors, and through older jewelers who specialize in antique jewelry – and you will pay quite a price for them. Most cultured strands start around $130, while it is not uncommon to pay that price (or much more) for a single natural pearl! 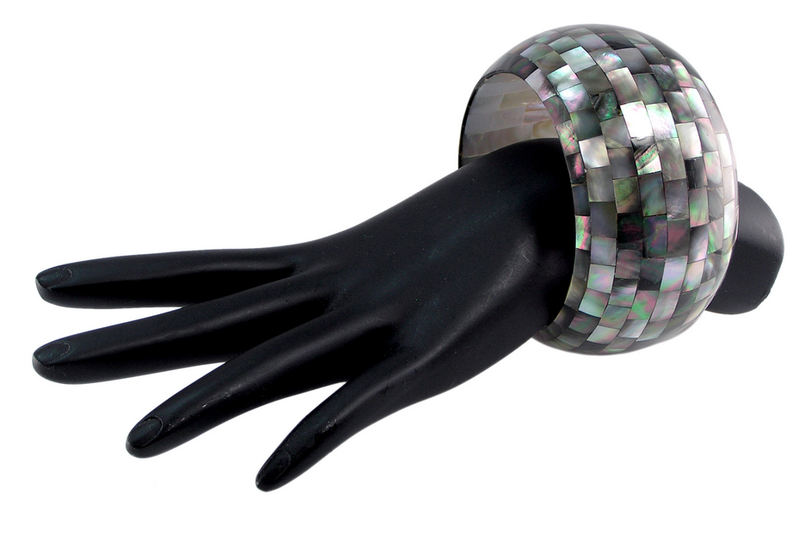 Abalone mother of pearl mosaic bangle from Pearls International. You may have seen Abalone jewelry in our store, as Abalone mother of pearl is commonly used in jewelry and many of the other applications you see mother of pearl from an oyster used. 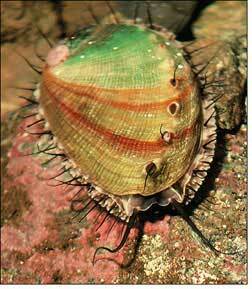 A red abalone sea snail from California. Abalone sea snails are found in rocky coastal waters all over the world, most commonly in Australia, New Zealand (where they are known as paua shells), South Africa, and California. They are commonly farmed and raised for food, and the meat is very valuable, selling for around $60 a pound. In addition to this, new methods are being developed to produce cultured mabé pearls from abalone snails. It is relatively easy to attach a bead to the inside of the shell of the snail without damaging the animal. However, it is impossible to culture a full Abalone pearl as they are hemophiliacs, meaning that if injured they will bleed out. Therefore, the nucleation process would kill the animal. Not to mention, the shape of the snail (being that it only has one shell, unlike oysters which have two) makes it hard to keep a bead in the shell long enough to begin the pearl-forming process. In fact, Abalone snails also have a large “foot” that is adept at kicking out foreign objects – such as a shell bead inserted by a human. A rough and polished New Zealand Abalone shell – look at those colors! You can imagine how rare it is, considering these factors, to find an Abalone pearl. It is estimated that only 1 in 50,000 Abalone sea snails will produce a pearl, usually the result of a foreign object such as an invading parasite becoming lodged in their shell. That alone makes them an incredible value to pearl collectors. Additionally, Abalone are the most colorful of all pearl-producing mollusks, so of course the pearls show the same amazing array of colors – fantastic blues, greens, silver shades, and purples, and sometimes with a hint of red or orange. 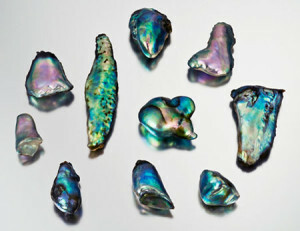 Abalone pearls are always baroque in shape, and the shape of them usually resembles a shark’s tooth. 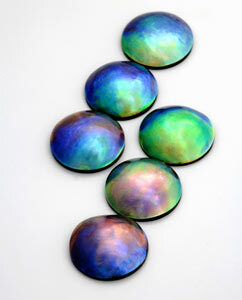 Prices on Abalone pearls are high and vary greatly depending on what the buyer is looking for, size, color, and luster. An average price range is $20-$100 per carat. An assortment of natural abalone pearls. 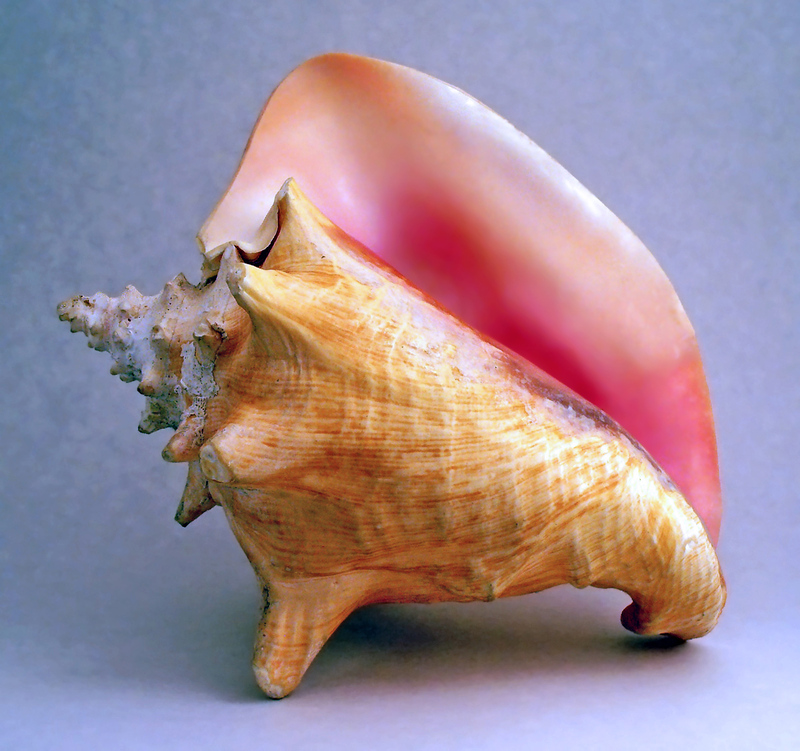 A conch shell with a nice bold pink inner coloration. Yes, pearls can even come from a conch shell! Conch is a general term referring to any medium or large sized sea snail, generally whose shell has a high spire and a noticeable siphonal canal. The specific conch that produces the wonderful and rare “pink pearls” is the Queen or Pink Conch, found in the Caribbean sea. While conch pearls may look like a pearl, they are not actually classified as such. Since conch contain no nacre (the substance that causes pearls to have the iridescent “luster” they are known for), conch pearls are more scientifically classified as non-nacreous calcareous concretions (what a mouthful!). They are formed in the same way other pearls are formed, and as all pearls are technically “calcareous concretions,” pearl collectors and enthusiasts everywhere still refer to them as pearls. Confusing, right? Conch pearls are usually relatively small, averaging around 3mm, and are mainly oval or baroque in shape. Conch pearls go for around $500 per carat, although this can increase drastically depending on shape, quality, and a property called flame – an amazing display on the surface of the gem that really does make it look like a fire burning on the surface. Conch pearl jewelry is seen in many elegant and extravagantly expensive necklaces (like this one! ), pendants, and rings. However, if you are fortunate enough to own one of these stunning pieces, beware that conch pearl color can fade over time when exposed to sunlight and other factors, so they must be stored and worn carefully. Who would have thought this giant snail could produce a pearl?! For those of you still giving oysters all the credit on the pearl market, here is yet another pearl-producing snail! Meet the Melo Melo snail, found in the waters of Vietnam, Malasyia, Burma, and sometimes China and the Philippines. 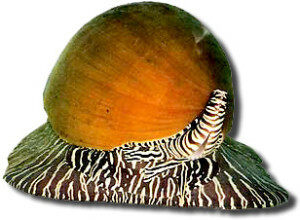 This sea snail is also known as the Indian Volute or Zebra Snail. There is no known way to culture pearls from this animal, so all melo melo pearls are natural. 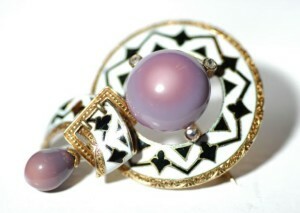 Like the conch pearl, melo melo pearls are not true pearls, but a non-nacreous, natural calcareous concretion. 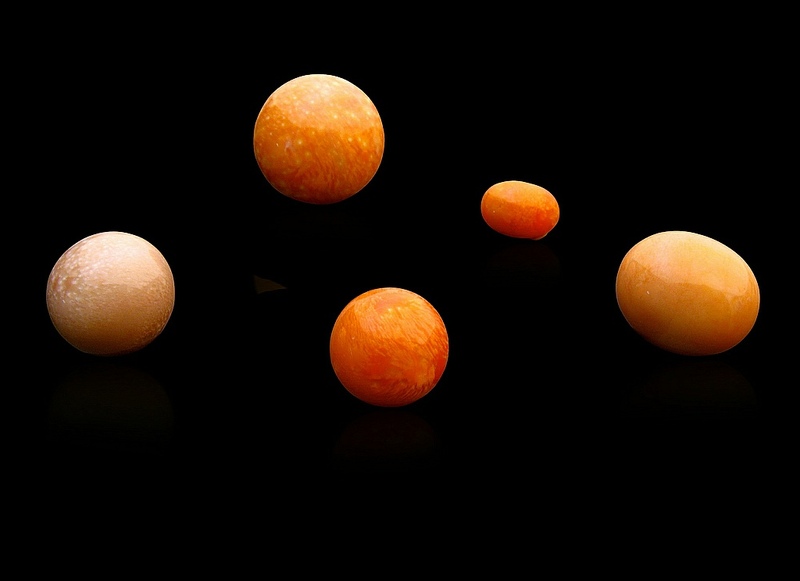 An assortment of melo melo pearls. Also known as Vietnamese pearls, melo melo pearls can range from tan to dark brown, hitting shades of orange in between. 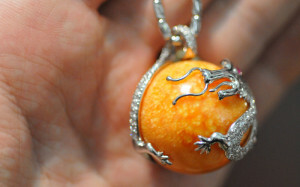 Pearls of a bright orange color, round in shape, and showing a flame pattern are the most beautiful and most valuable. 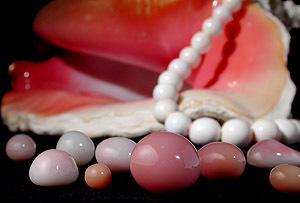 These pearls are usually symmetrical and round or near round, and range in size from 7mm and even up to 40mm. That is a huge pearl! Of course, a pearl of that size would command an incredible price on the market. 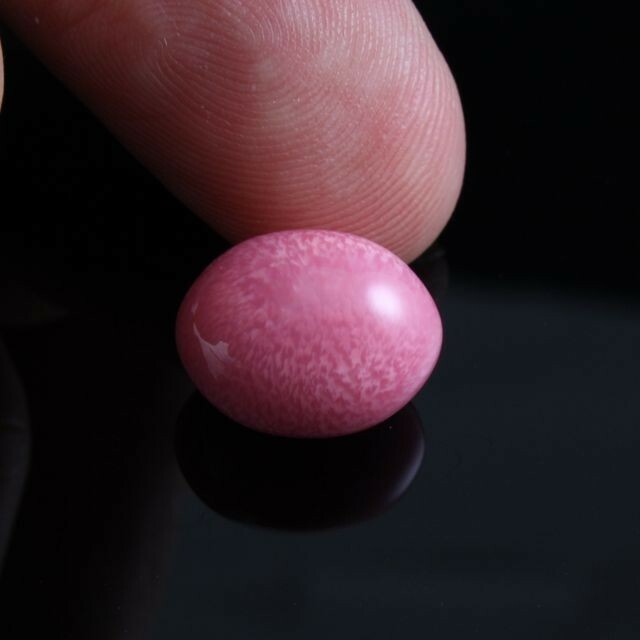 It is not uncommon for even a small melo melo pearl to sell for over $1,000. This set of melo melo pearls includes a necklace, earrings, and ring set with diamonds and jadeite – stunning! Melo melo pearls are even more rare than conch pearls – the only known strand (pictured above) contains only 14 of these pearls, which is a relatively small number compared to more traditional strands. It is most commonly used in rings and pendants, although you may occasionally be able to find a pair of matched earrings. 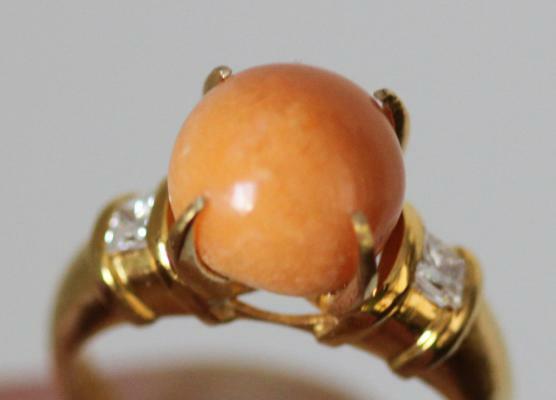 This melo melo pearl ring shows off the pearl in a simple 14k gold setting. Steamed quahog clams..wonder if they’re hiding any ocean treasure in there? Quahog pearls (pronounced KO-hog) are possibly the rarest find on our list so far. Produced by a non-nacreous saltwater clam found along the Atlantic coastline, called Mercenaria Mercenaria, these pearls take about 4-8 years to form, and are most commonly found in white, beige, brown, and sometimes near black. 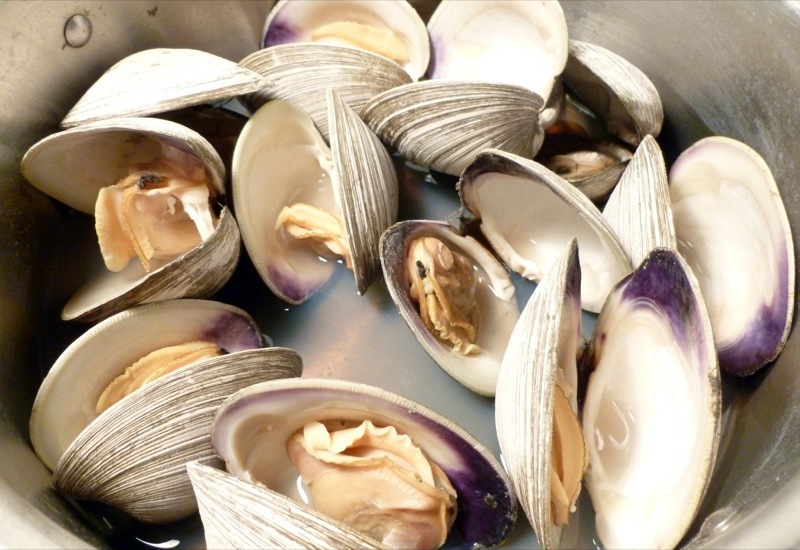 The most rare and prized quahogs, however, are purple or lilac in color, and this variety of clam is only of the only mollusks capable of producing a truly purple pearl. 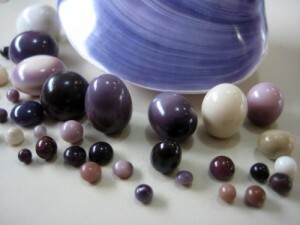 An amazing selection of quahog pearls. We’re not sure why these clams are not used for culturing pearls, but we have a couple of guesses. For one, they do not produce nacre, which all cultured pearls are required to have to be classified as a true pearl. Also, these pearls take an unusually long time to form, and usually only form in older specimens because of this. Additionally, mollusks farmed for food are not usually used for pearl production, and vice versa. With the quahog market being as scarce as it is, and all of these factors considered, it would likely not be cost effective to farm them on the rare chance of getting enough purple pearls to build up the market. 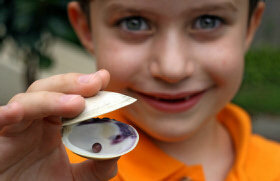 7-year-old Connor O’Neal found this quahog pearl while eating his favorite food, clams. As all quahogs are natural, and the clams are often used in food, most of these pearls are actually acquired by unsuspecting patrons at their local seafood bar. They are so uncommon (not to mention fragile) that the asking price usually far exceeds what one is willing to pay for them, therefore most of the lucky finders of these beauties tend to hold on to them or set them in jewelry for themselves or loved ones. Whether or not the demand for these pearls will increase in later years is hard to tell, but if the quahog market continues to follow the trend with the rest of the natural pearl family, we may see more of these for sale in the future. 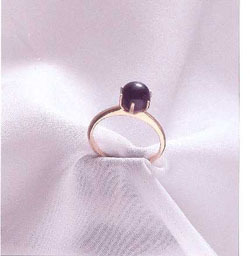 A rare quahog pearl ring – quahog pearl jewelry is hard to find as they are so rare and brittle. 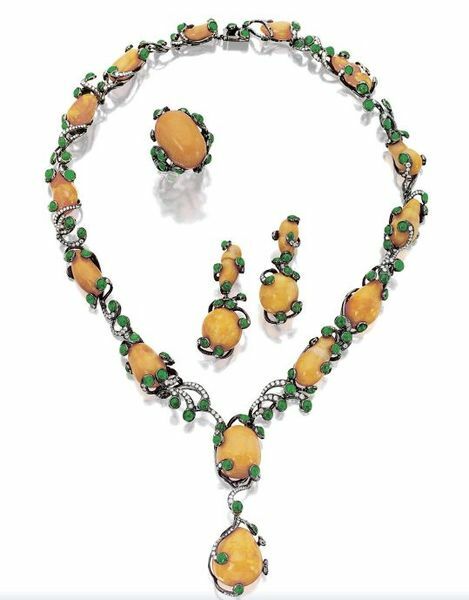 One rare and incredible piece of quahog jewelry was found by a man named Alan Golash, of Newport, Rhode Island. Golash buys and restores antique jewelry for a living, and found this amazing piece at an antique store. It cost him a mere $14. 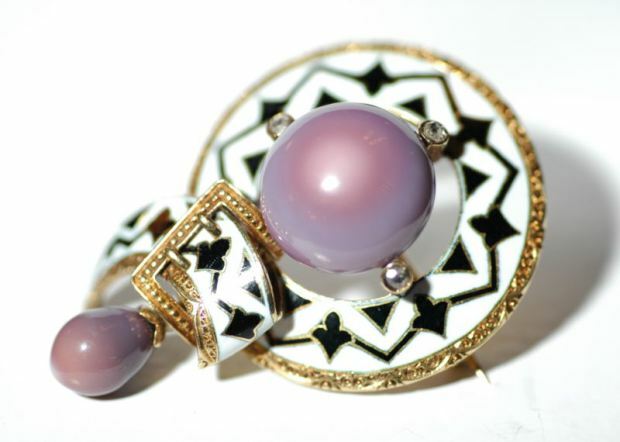 Upon inspection, it was found to be composed of two quahog pearls – one measuring 14mm – 18k gold, three small diamonds, and black and white enamel. Not much is known about the history of this piece, but Golash believes it to be around 150-200 years old. He speculates that it may have belonged to the wife of a captain of a whaling or clipper ship, as they were of high class during that period of time and would have had the financial ability to procure such a piece. The current value of the piece is subject to a lot of speculation, as an exact value for quahog pearls is very difficult to pinpoint. Golash has the piece insured, but has not released the appraisal value to the public. Not as rare as the others, but equally interesting, is the scallop pearl. Formed primarily in the Lion’s Paw Scallop of North, Central, and South America, these non-nacreous pearls occur in around one in every 50,000 scallops. Any pearls collected are byproducts of the fishing industry. They too are only found, never cultured. 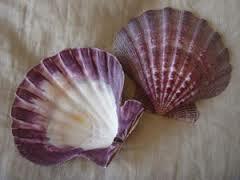 Scallop pearls are usually small and range in color from shades of brown to plum or purple, orange, and white-purple. 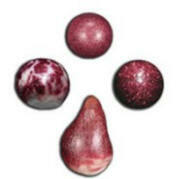 Brown is generally undesirable, and the pearl has to be very high quality to be marketable if it is also brown. The calcite in scallop pearls usually forms in microscopic platelets that show a type of “adventuresence” that makes it appear that these pearls have a type of glitter shimmering beneath the surface, gaining them the nickname “glitter pearls.” Scallop pearls sell for around $50-$500 a piece depending on quality. After seeing all these beauties, we are even more pearl crazy than before! These aren’t even all of them – there are also Pen pearls (nacreous and non-nacreous oyster pearls), various other clam pearls, and Cassis pearls (another pearl from a sea snail) just to name a few! Nature’s little treasures really are breathtaking. 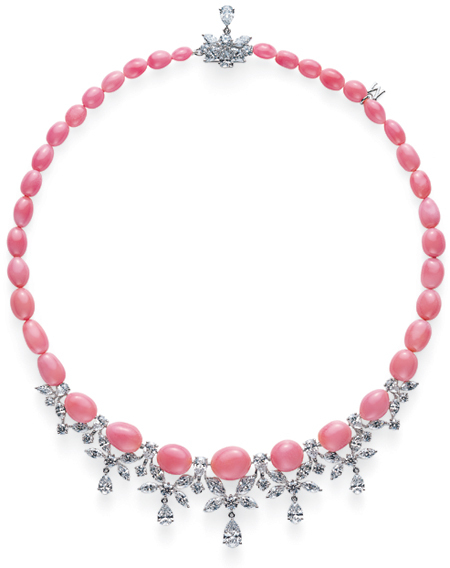 It’s no surprise that natural pearls have such an incredible following in the jewelry industry and in the pearl market. If this blog interested you, you may enjoy part 2 – an article about some amazing and historical natural pearl pieces that have sold in auction, such as the famous La Peregrina. Dream of coming across your own special pearl one day at the oyster bar? 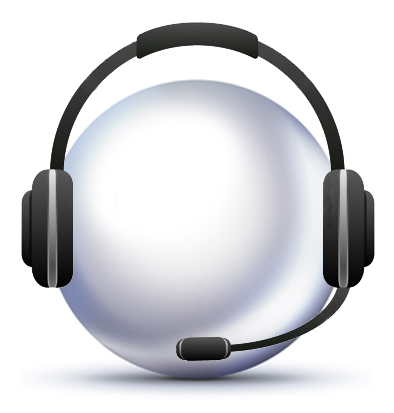 Why not check out the next best thing and open your very own wish pearl from Pearls International! You could open your very own oyster – each one guaranteed to contain a special lucky treasure! Get the latest style news and offers from Pearls International before everybody else does.